Dabke (Arabic: دبكة‎ also spelled Dabka, Dubki, Dabkeh, plural Dabkaat) is a native Levantine folk dance performed by Lebanese, Syrians, Palestinians, and Jordanians. Dabke combines circle dance and line dancing and is widely performed at weddings and other joyous occasions. 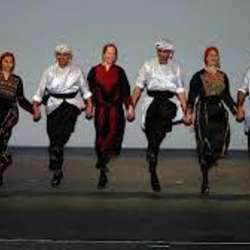 The line forms from right to left and leader of the dabke heads the line, alternating between facing the audience and the other dancers. In English, it can be translated as dabka, dabki, dabkeh.